OMNI announced its highly-anticipated Winter 2017 issue, focusing on topics of time travel and the mysteries of time. Los Angeles, CA - Iconic science and science fiction magazine, OMNI, announces its highly-anticipated Winter 2017 issue. 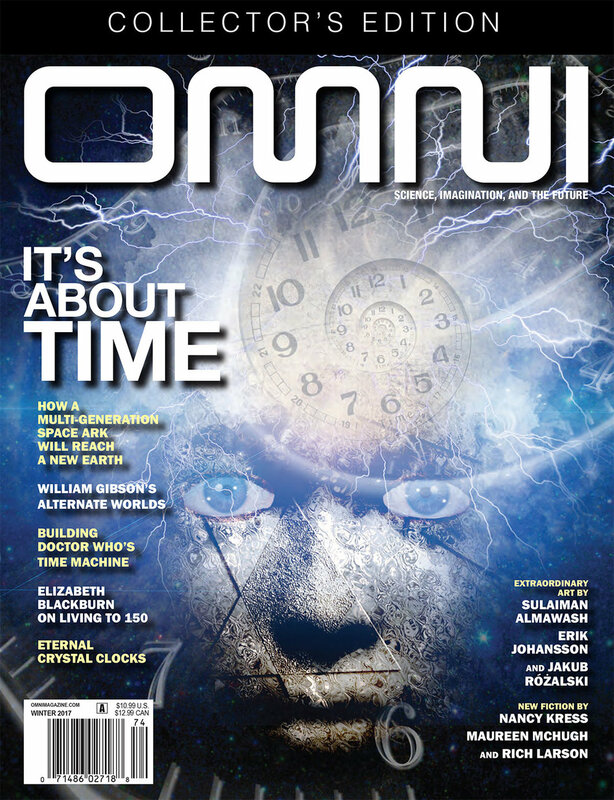 In addition to the print magazine, OMNImagazine.com will explore science and imagination at the crossroads of culture. The site will publish all-original content, including interactive features, a participatory Mind-Brain Lab, fiction from emerging writers, wide-ranging blogs on technology, gaming, evolution, and cosmology, as well as coverage of genre film, TV, fiction, and the arts. OMNI also welcomes back Ellen Datlow as their fiction editor. Datlow has been a recipient of the Karl Edward Wagner Award, given at the British Fantasy Convention for “outstanding contribution to the genre,” was honored with the Life Achievement Award by the Horror Writers Association, in acknowledgment of superior achievement over an entire career, and honored with the World Fantasy Life Achievement Award. Most recently Datlow won the Locus Award for Best Editor and the Hugo Award for Best Editor, short form. “This remains the magazine of wide-open possibilities, tapping the same spirit of awe and anticipation that propelled the original OMNI, but for the zeitgeist of today,” said Editor-in-Chief Pamela Weintraub. “We are still explorers across space and time. We still honor exceptional journalism that surveys the outer limits of human intellect, and top fiction that ventures into the even more remote realms of imagination. Every so often, we expect to take a hard left turn to the mysterious, fantastic, and unknown.” Weintraub was part of OMNI’s early team and later served as its Editor. As a nod to the magazine’s early incarnation and its leap into the future, the Winter 2017 issue devotes itself to time travel and the mysteries of time. Notable features include Sherry Baker’s “Doing Time on a Generation Starship,” mind-bending photography from Erik Johanson and Sulaiman Almawash, an interview with iconic author William Gibson, and fiction from author Nancy Kress, Maureen McHugh, and Rich Larson, to name a few. It represents a new star in the magazine’s historic constellation, which traces back to its first publication in 1978. OMNI’s vision of the future continues to be filled with awe and scientific wonderment. Visit OMNI’s official website at OMNImagazine.com or follow the company on Twitter @OMNIMagazine. OMNI’s highly anticipated new issue hit newsstands in November, addressing the cultural yearning for science and innovation during a time of political uncertainty. The magazine, first published in 1978, was best known for its Q&As with the world’s top thought leaders, like Richard Feynman, Candace Pert, and Freeman Dyson, its gonzo-style journalism, literary long-form on the sciences, award-winning fiction, and stunning, futuristic art. OMNI published work by George R.R. Martin, Stephen King, William Gibson, Octavia E. Butler, Ursula K. Le Guin, and renowned artist H.R. Giger. Omni was founded by Kathy Keeton and her long-time collaborator and future husband Bob Guccione, the publisher of Penthouse magazine. The magazine ceased publication abruptly in 1997, following the death of co-founder Kathy Keeton but returned in 2016 with two print issues. It is considered to be a pioneer for its time. Follow the company on Twitter (@OMNIMagazine) or Facebook (RealOMNI). Visit OMNI’s official website at OMNImagazine.com. Press inquiries can be directed to press@omni.com.